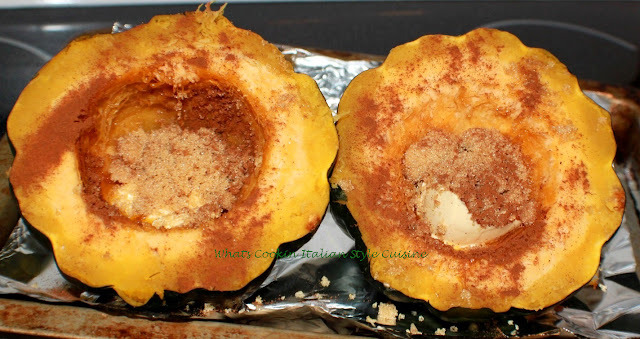 Acorn squash taste similar to butternut squash or even sweet potato in flavor. These are made baked with a cinnamon sweetness. Using the tips on cutting the Acorn Squash, slice in half, scoop out seeds. Slice off the point so it lays flat on a foil lined cookie sheet. Place around 2 tablespoons of butter in each center and sprinkle generously with brown sugar and cinnamon around 1 teaspoon cinnamon to 2 tablespoons of sugar. Bake on 400 degrees until soft and when pierced with a fork.